I’ve been getting a great deal of questions lately on pizza dough, so this is my attempt to answer. There are two standard pizza crusts I tend to use. One I consider an American Northwestern standard written by Wolfgang Puck, and the other is a slow rising true Italian style dough. 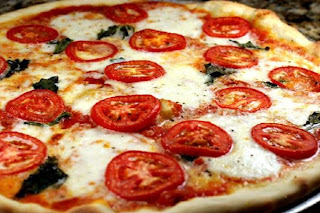 The recipe for the Italian pizza comes from Forno Bravo and is typical Italian dough. The only thing up for debate with the Italian style seems to be the amount of yeast. Some recipes want ½ teaspoon while others stick to 1/4 teaspoon. Either way this is dough that needs to rest for 24 hours. 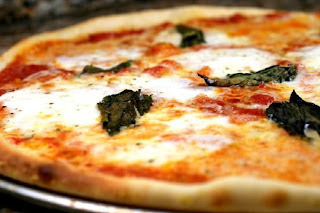 A difference between Italian and American pizza dough is the bite. The bite of the Italian crust is consistently thin but not too thin, crispy on the bottom and a bit soft on top, but not too chewy either, and had more substance per bite. When I was in Italy I noticed that the pizza crusts were all very similar. This makes sense as food is a way of being, a tradition to be held on to and celebrated passionately. I don’t add anything extra, because if I did it wouldn’t be Italian style dough anymore to me. The American crust can vary greatly as we are a people with fewer strong food roots, and with many different cultures to influence our palates. Our crusts run from the thick and bready Chicago, to the thin New York fare, to California’s innovations, and everything in between and beyond. Being from the Northwest I’m writing about what I know well, the Wolfgang Puck dough style. 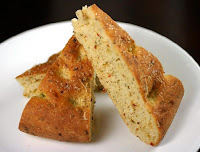 It’s a bit chewy, and once again not to thin or thick, but can be easily made so if needed. I feel its very adaptable to any herbs, spices, and olive oils I wish to add. One thing I always do is grill my pizzas. I turn my grill up to high, close the lid and walk away for about 25 minutes. Meanwhile I put my dough on my favorite pizza pans, add the sauce and toppings. Next I put one pan at a time on the grill (unless I’m grilling personal sized pizzas, then they all go on at once), close the lid, turn the heat to medium high, and cook for about 5 minutes. More or less cooking time will be required depending on the size of the pan, the type of the pan, and the crust. For thicker crusts turn the heat to medium after closing the lid and cook for a few minutes longer. This way your pie will cook through without being completely burnt on the bottom. I have a very strong pizza pan preference. Doughmakers makes my all time favorite pans. They survive my grilling abuse and they cook pizza so well. Here is what they have to say out their product, “The patented pebble surface pressed into each product offers unparalleled baking performance. By providing more space between the surface and the baked good. Doughmakers Brand achieves the pinnacle in evenly baked foods. Combined with all aluminum construction, our products allow for quicker release and shorter cooling times. Cleanup is reduced, as non-stick sprays are not required." I always brush my pizza pans with a thin coat of olive oil and sprinkle with coarse cornmeal. This is most likely optional, but I love what the cornmeal does to my crust. Below are the two pizza dough recipes. Both have their place and both are excellent. Oh yeah, and if you need sauce recipes I've got 'em! With this recipe you can make four pizzas, as described below, or you can divide the dough in half and make two large 12- inch pizzas. The baking time will be the same. Chopped fresh basil, chopped sun-dried tomatoes, or a sprinkling of crushed red pepper flakes can be added to the dough with the flour, if desired, for additional flavor. Be creative with your pizzas! 4. Place a pizza stone on the middle rack of the oven and preheat the oven to 500º F.
6. To prepare each pizza, dip the ball of dough into flour, shake off the excess flour, place the dough on a clean, lightly floured surface, and start to stretch the dough. Press down on the center, spreading the dough into an 8-inch circle, with outer border a little thicker than the inner circle. If you find this difficult to do, use a small rolling pin to roll out the dough. 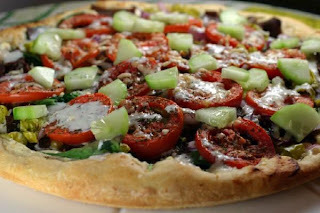 Lightly brush the inner circle of the dough with oil and arrange the toppings of your choice over the inner circle. Notes: I've found that getting all the kneading out of the way before it rises, then dividing the dough in half and just pressing them out (without more kneading) with the edge of my palms and my fingers makes a better crust than rolling out the dough. We highly recommend cooking by weight. It is fast, and easy to get the exact hydration (water to flour ratio) and dough ball size you want. Personally, I do not use recipes or a mixing cup when I cook dinner for the family, but pizza and bread dough is different. Being exact counts and nothing works better than a digital scale. Cover the dough and let it rise for 1 1/2 - 2 hours, or until double. Punch it down and push out the air bubbles. Form the dough into a large ball, then cut it into 4-5 equal pieces. If you won't have an hour to let your dough rest, read our Dough in a Hurry strategy. By cutting back each phase of dough preparation by the right amount, you can make great pizza or focaccia dough in as little as an hour. 1. I always end up adding more flour to the Forno Bravo Italian style dough to make it workable. If I don't it sticks to everything. I want it tacky, but not so much so that I can't get it off my hands. 2. I use high quality all-purpose flour or bread flour if I don't have 00 flour around. Pictures and writeup by Laura Flowers. These are my personal thoughts on pizza and may or may not be fact. Instead they are how I see pizza dough from Northern Idaho, through my travel experiences, and many hours of making pizzas. Dough recipes belong to Wolfgang Puck and Forno Bravo. Sauce recipes & pictures by Laura Flowers. Laura, this is a wonderful recipe. I'm partial to paper thin crusts but so like pizza that I make exceptions - all the time. Thank-you Mary! Like you, I love all pizzas. Very very nice, i am going to make the Wolfgang Puck version for tonights dinner. I knew i could rely on you for a good crust. Thanks for the pizza tips and dough recipes. I am still trying to find one that works for me. Your photos are great, too. Mary, I just thought about this and wanted to share. When I want very thin crust I roll out my dough on an olive oiled surface. I've never gotten it cracker thin of course, but it gets pretty thin. What nonsense; " you can't get good pizza in the UK". I live just across the road from a wonderful Italian restaurant which makes amazing pizza which tastes great and authentically italian - I suppose it helps that the chef is Italian too. You should get out more, go to more restaurants, explore. There are lots of good places to eat pizza in the UK. Anonymous, I did not say that. This is just a personal writeup comparing the two main recipes I use, the way I cook them, and the pans I use. I’m guessing the UK has some amazing pizzas! This sounds amazing! I just made pizza on Friday and I've been looking for a thinner crust recipe. The recipe I have now is more of a Sicilian type crust...thicker and chewy. oh I've been wanting to make pizza dough! yUP, I'M BACK, STILL LOOKS GOOD! I can't wait to try these recipes...however I'm in a pinch...I can't find the Molino Caputo Tipo 00 anywhere besides ordering it online. Is there another suitable flour? Thanks. Hi, yes! Just use a high protein all purpose, or a bread flour and you'll be ok.
What can I say...I'm lovin' it! takes me right back to my visit to Milan ages ago...the tin pizza base sang to me then, as it is doing here! I'm off to knead the dough! The garlic cream sauce is haunting me too...Bless you Laura! My sister-in-law served this pizza crust to us just the other day--fantastic! Thank you for providing a printable version! It often makes a difference as to whether or not I will try a recipe. Do you have a digital scale that you recommend? I use a 2kg Terraillon. I've had it for several years and it works well. It's not an expensive one either; I think I paid around $25. It also measures both grams and ounces, but I think most of them do. Thank you for the digital scale info! These all look so delicious, I just wondered what recipe you used for the in-between doughs? As some are not as thin as the Italian.. but don't have a hard crust like the American style..they're not bready either but they seem chewy and doughy with a flat-ish crust - like the "olive, garlic & rosmary pizza" and the "spinach bruschetta pizza"